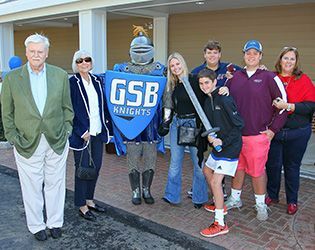 During Family Day on September 24, the school officially dedicated its new Field House, paying tribute to those who made contributions to the building's design and construction. The dedication took place at the building's front entrance. 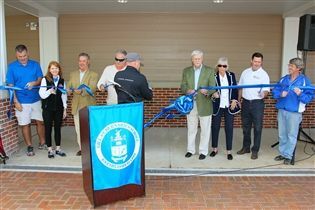 David and Jill Farris, GP '11, '13, '15, '17, '17, '20, who took a leadership role in support of the Field House campaign, had the honor of cutting the ribbon and thereby officially opening the facility. In recognition of their support for the project, the basketball court in the Field House has been named the Farris Forum. 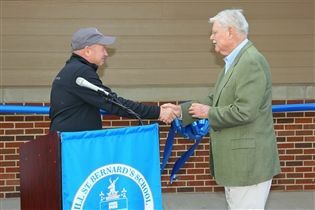 Reflecting on the ceremony, Head of School Sid Rowell offered, "We are thrilled to open this wonderful new facility on our campus. Dave and Jill’s faith in our school and their generosity are remarkable." Rowell also thanked others who were essential to the project, including the architects, representatives from the construction company and the many Gill families who came forward to support the Field House campaign. The 14,400-square-foot Field House comprises a multi-sport practice and game court as well as a fitness center and locker rooms. It will serve as the principle gymnasium for the school’s Lower and Middle School students. With the completion of the Field House, the focus of the campaign will be the construction of a new performing arts and community center. That facility will house the school’s award-winning theater and music programs, as well as concerts, assemblies, lectures and other events.